EAST ELMHURST — A new boutique wine shop selling bottles from lesser-known vineyards around the globe is hoping to give customers an education along with every purchase. Addictive Boutique Winery opened in November adjacent to the Addictive Boutique, a small clothing store on 87th Street off Northern Boulevard. Owner Francisco Diaz, 43, launched the clothing store more than a year ago and sells items made by small designers worldwide. He decided to open the small wine shop by closing a portion of the boutique and designing the cozy shop in that space. Diaz has curated the new shop much like he does the clothing store, focusing on smaller wines from all corners of the globe — from Argentinian Malbecs to German Rieslings. The interior designer, artist, actor and business manager spent 15 years living in Jackson Heights and now resides in College Point. Diaz runs the shop with his partner, Patrick Duong, 39, who also works as an engineer. Both are passionate about wine, touting it's health benefits as well as its rich history. They said their customers have been eager to try wines they've never heard of, and will even open up a bottle for a customer to taste if they aren't sure. "It's amazing the way people love wine in this neighborhood," Diaz said, adding that the shop has had a good response during weekend tastings. In order to walk customers through the wine-buying process, staffers study the history of wine, pairing charts and the countries of origin for specific wines. Some patrons have left the store with three or four bottles of wine they'd never tasted before, the partners said. 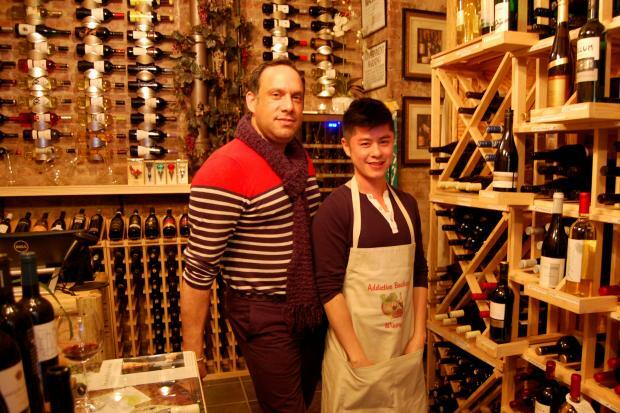 "Our concept isn't just for customers to buy wine," Duong said. "We want to explain the process, the details, to see that there is a story behind the wine." Addictive Boutique Winery is open seven days a week, 12:30 p.m. until 11 p.m. Monday through Saturday, 12:30 p.m. until 9 p.m. Sunday. For information on wine tastings and other events, like them on Facebook.